1. the process or act of supplying a house or room continuously with fresh air. 2. in respiratory physiology, the process of exchange of air between the lungs and the ambient air; see alveolar ventilation and pulmonary ventilation. See also respiration (def. 1). Called also breathing. 3. in psychiatry, verbalization of one's problems, emotions, or feelings. alveolar ventilation a fraction of the pulmonary ventilation, being the amount of air that reaches the alveoli and is available for gas exchange with the blood. assist/control mode ventilation positive pressure ventilation in the assist-control mode; if the spontaneous ventilation rate falls below a preset level, the ventilator enters the control mode. assist mode ventilation positive pressure ventilation in which the ventilator is in the assist-control mode; see also control mode ventilation and assist/control mode ventilation. controlled ventilation (control mode ventilation) positive pressure ventilation in which the ventilator is in control mode, with its cycle entirely controlled by the apparatus and not influenced by the patient's efforts at spontaneous ventilation. high-frequency ventilation a technique of mechanical ventilation that uses very high rates (over 80 breaths per minute) and small tidal volumes (equal to or less than dead space); it may either be positive pressure ventilation or be delivered in the form of frequent jets of air. It is used to lower the peak airway pressure applied to the lung, thus decreasing the risk of barotrauma. high-frequency jet ventilation a type of high-frequency ventilation characterized by delivery of gas through a small catheter in the endotracheal tube. high-frequency percussive ventilation a type of high-frequency ventilation characterized by delivery of pressure-limited breaths in short bursts of gas from a venturi mask. high-frequency positive pressure ventilation a type of high-frequency ventilation characterized by low compressible volume circuit and tidal volume delivery of 3 to 4 mL per kg. impaired spontaneous ventilation a nursing diagnosis accepted by the North American Nursing Diagnosis Association, defined as a state in which an individual's decreased energy reserves result in inability to maintain breathing adequate to support life. See also spontaneous ventilation. intermittent mandatory ventilation (IMV) a type of control mode ventilation in which the patient breathes spontaneously while the ventilator delivers a prescribed tidal volume at specified intervals and allows the patient to breathe spontaneously between cycles. The ventilator rate is set to maintain the patient's PaCO2 at desired levels and is reduced gradually to zero as the patient's condition improves. See also intermittent positive-pressure breathing. intermittent mandatory ventilation, synchronized (SIMV) positive pressure ventilation in which the patient breathes spontaneously while the ventilator delivers a positive-pressure breath at intervals that are predetermined but synchronized with the patient's breathing. intermittent positive pressure ventilation (IPPV) intermittent positive pressure breathing. maximal voluntary ventilation (maximum voluntary ventilation (MVV)) the maximum volume that can be exhaled per minute by the patient breathing as rapidly and deeply as possible. Called also maximal breathing capacity. 1. ventilation accomplished by extrinsic means, usually distinguished as either negative pressure or positive pressure ventilation. See also spontaneous ventilation. 2. in the nursing interventions classification, a nursing intervention defined as the use of an artificial device to assist a patient to breathe. minute ventilation the total volume of gas in liters expelled from the lungs per minute. See also minute volume. Called also total ventilation. negative pressure ventilation a type of mechanical ventilation in which negative pressure is generated on the outside of the patient's chest and transmitted to the interior of the thorax in order to expand the lungs and allow air to flow in; used primarily with patients having paralysis of the chest muscles. See also ventilator. 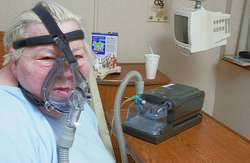 noninvasive ventilation mechanical ventilation that does not use an artificial airway, such as positive pressure ventilation with a nasal or face mask. partial liquid ventilation ventilatory support in which the lungs are filled to the level of the functional residual capacity with a liquid perfluorocarbon; mechanical ventilation is then superimposed and oxygen and carbon dioxide are transferred through the liquid. positive pressure ventilation any of numerous types of mechanical ventilation in which gas is delivered into the airways and lungs under positive pressure, producing positive airway pressure during inspiration; it may be done via either an endotracheal tube or a nasal mask. See also ventilator. pressure control ventilation positive pressure ventilation in which breaths are augmented by air at a fixed rate and amount of pressure, with tidal volume not being fixed; used particularly for patients with acute respiratory distress syndrome. pressure support ventilation positive pressure ventilation in which the patient breathes spontaneously and breathing is augmented with air at a preset amount of pressure, with tidal volume not being fixed. proportional assist ventilation positive pressure ventilation in which the ventilator can sense the patient's level of inspiratory flow and deliver pressure support to achieve a given tidal volume. pulmonary ventilation a measure of the rate of ventilation, referring to the total exchange of air between the lungs and the ambient air, usually in liters per minute. spontaneous ventilation term used to denote breathing accomplished naturally, without any artificial aids, as opposed to mechanical ventilation and other forms of artificial respiration. 1. Replacement of air or other gas in a space by fresh air or gas. 2. Movement of gas(es) into and out of the lungs. 3. In physiology, the tidal exchange of air between the lungs and the atmosphere that occurs in breathing. 1. breathing; the exchange of air between the lungs and the environment, including inhalation and exhalation. 2. circulation, replacement, or purification of the air or other gas in a space. 3. the equipment with which this is done. 4. verbalization of one's problems, emotions, or feelings. alveolar ventilation the amount of air that reaches the alveoli and is available for gas exchange with the blood per unit time. high-frequency ventilation mechanical ventilation in which small tidal volumes are delivered at a high respiration rate. maximum voluntary ventilation maximal breathing capacity; the greatest volume of gas that can be breathed per minute by voluntary effort. mechanical ventilation that accomplished by extrinsic means; usually either negative pressure v. or positive pressure v.
minute ventilation total v.; the total volume of gas in liters exhaled from the lungs per minute. negative pressure ventilation mechanical ventilation in which negative pressure is generated on the outside of the patient's chest and transmitted to the interior to expand the lungs and allow air to flow in; used with weak or paralyzed patients. positive pressure ventilation mechanical ventilation in which air is delivered into the airways and lungs under positive pressure, usually via an endotracheal tube, producing positive airway pressure during inspiration. pulmonary ventilation a measure of the rate of ventilation, referring to the total exchange of air between the lungs and the ambient air. a. The replacement of stale or noxious air with fresh air. b. The mechanical system or equipment used to circulate air or to replace stale air with fresh air. a. The maintenance of breathing by artificial means. b. A breath that is induced by artificial means. the ratio of pulmonary alveolar ventilation to pulmonary capillary perfusion, both quantities expressed in the same units. Pulmonology The exchange of air between the lungs and the outside air. See Dead space, High-frequency ventilation, Jet ventilation, Maximum voluntary ventilation, Mechanical ventilation, Noninvasive positive pressure ventilation, Partial ventilation, Staircase ventilation Public health The circulation of air from one space to another, usually understood to mean the replacement of ambient air with fresh air from another source. See General exhaust, Local exhaust, Mechanical exhaust. 2. Movement of gases into and out of the lungs. 3. physiology The tidal exchange of air between the lungs and the atmosphere that occurs in breathing. in physiology and medicine, refers to pulmonary ventilation, the movement of air in and out of the lungs, whether during normal breathing, or by artificial means. total ventilation or minute volume E (or I) is the volume breathed out (or in) in litres per minute: the tidal volume multiplied by the number of breaths per minute. May be measured, e.g. by collecting the expired gas over a known time (Douglas bag method), or by integrating inspired or expired airflow with respect to time (by pneumotachograph). The effective component, alveolar ventilation A, refers to that which reaches the regions of the lungs where gas exchange occurs, and is equal to the total ventilation minus dead space ventilation D. Normally, at rest, A : D = 2:1 or typically, E - D = A, 6 - 2 = 4 L.min-1. When ventilation increases in exercise, the dead space is unchanged, so D rises only in proportion to the rise in frequency of breaths, but E rises relatively more as tidal volume also increases. See also artificial ventilation, dead space, lung volumes and capacities. n the constant supplying of oxygen through the lungs. n the process of supplying alveoli with air or oxygen. n a method by which a rescuer uses the air in his or her own lungs to fill the lungs of another person who has stopped breathing in order to oxygenate that person's blood. See respiration, artificial. n the process of getting air into and out of the lungs. The air enters the oral cavity and nose and must go through the conduction system (the pharynx, larynx, trachea, and bronchial tree) into the lungs. This ventilating process involves many other structures as well, including the abdomen, thorax, and maxillofacial tissues. The latter structures make two significant contributions to the respiratory process: they provide the portal of entry and egress for the air to and from the lungs, and they alter the physical properties of inspired air for protection of the very sensitive lung tissues. renewal or exchange of gas in an enclosed space. 1. the process or act of supplying a building or part of it continuously with fresh air. 2. in respiratory physiology, the process of exchange of air between the lungs and the ambient air. Pulmonary ventilation (usually measured in liters per minute) refers to the total exchange, whereas alveolar ventilation refers to the effective ventilation of the alveoli, where gas exchange with the blood takes place. See also air movement. the amount of gas expelled from the alveoli to the outside of the body per minute. the depth of spontaneous ventilation is augmented by the anesthetist, as by squeezing the rebreathing bag. breathing is done entirely by a mechanical device or the anesthetist squeezing the rebreathing bag. mechanical ventilation that delivers gas at more than four times the normal rate of breathing. a type of mechanical ventilation in which the ventilator is set to deliver a prescribed tidal volume at specified intervals and a high-flow gas system permits the patient to breathe spontaneously between cycles. The ventilator rate is set to maintain the patient's Paco2 at normal levels and is reduced gradually to zero as the patient's condition improves. the provision of mechanical ventilation by a machine designed to deliver breathing gas until equilibrium is established between the patient's lungs and the ventilator. IPPV machines are positive-pressure, pressure-cycled, assister-controller (pneumatic) devices. Because of their compact size and capability of operating independently of an electrical current, the IPPV machines have the most widespread applicability in the employment of a form of treatment called intermittent positive-pressure breathing. the maximal volume that can be exhaled per minute by the patient breathing as rapidly and deeply as possible. that accomplished by extrinsic means. the total amount of gas (in liters) expelled from the lungs per minute. mismatches of ventilation and blood flow, as in chronic obstructive lung disease, are a common cause of hypoxemia. the ratio of air ventilation to the blood perfused. Called also VA/Q. The degree of oxygenation of the blood and the proportional excretion of CO2 are both dependent on both variables being optimal. administration of oxygen under pressure, usually by use of an anesthetic bag or mechanical ventilator. See also continuous positive airway pressure, positive end-expiratory pressure. breathing without the assistance of any ventilator or mechanical device. the amount of air moved out of (or into) the airways and alveoli over a specified time period.